Now it's easy to bring rustic cabin décor into your home.Our Sycamore Tree Decorative Throw Pillows are made to look like the real thing! They're also made to be super plush, soft and fluffy so you can rest in comfort and style. Use it within the home, while traveling, camping or as a decoration for your sofa. It serves well as a pillow to rest your head, neck or something to provide back support. Made to be ultra-lightweight and the perfect size, at 19"x 7", it makes a great gift for nature lovers. JustNile's decorative Sycamore Yree throw pillow comes compressed in its package. Simply remove the packaging and let the pillow fluff up on its own. Give it a little time and your real-looking wood log pillow will be ready for use! LIFELIKE DESIGN: The cylinder Sycamore tree truck shape, printing and pattern is easily mistaken for the real thing. Bring the outdoors inside; perfect for using at home, camping or out in the woods and in the cabin. 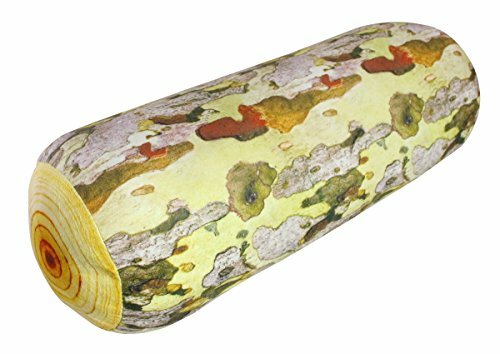 DECORATE WITH NATURE: Whether you are at home or at the cabin, the natural look of this Sycamore tree trunk cushion will spice up the room; add some plants and enter into your own lush oasis of comfort. LIGHTWEIGHT & PERFECT SIZE: The perfect travel buddy: lightweight design makes it easy to carry; size measures 19" x 7" for compact traveling or as a perfect gift for outdoor tree and wood lovers. QUALITY CONSTRUCTION: Made to be ultra-soft and comfortable, the foam filling provides long-lasting support for your head, neck, back and more; the cylinder Sycamore tree trunk shape is great for travel. WHAT YOU GET: Wood log decorative throw pillows are packed compressed; open up the package and the pillow will fluff up by itself - just give it a little time.